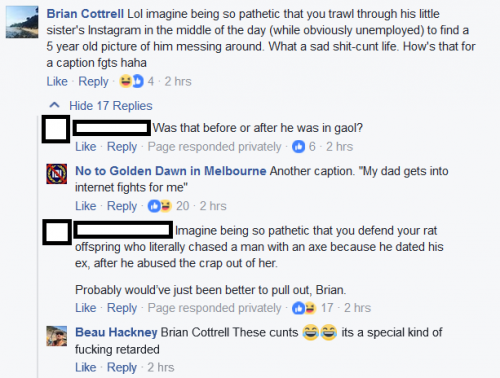 Brian also apparently doesn’t like Jews any more than his son does — but that comment went down as quickly as it went up. The apple doesn’t fall far from the tree eh? Also in September, Tory MP Nick Wakeling was revealed to be the brother of neo-Nazi and Cottrell and United Patriots Front fanboy Tim Wakeling. According to the Herald Sun (Liberal MP Nick Wakeling rejects brother’s extremist Facebook views, Anthony Galloway, September 10, 2017), Nick has no desire to join his brother in dreaming of the mass killing of Jews at Auschwitz. In the meantime, Tim’s younger kameraden have been distributing neo-Nazi propaganda at the University of Tasmania campus: Nazi attack on University of Tasmania campus condemned, Nick Clark, The Mercury, September 25, 2017. Finally, Melbourne University Press is doing a local print run of Mark Bray’s book Antifa: The Anti-Fascist Handbook and Andrew Fenton has written on Australia’s far right fighting for attention (CNN, September 23, 2017), which includes, inter alia, reference to the fact that Neil Erikson is intending to profit from the upcoming Romper Stomper TV show. 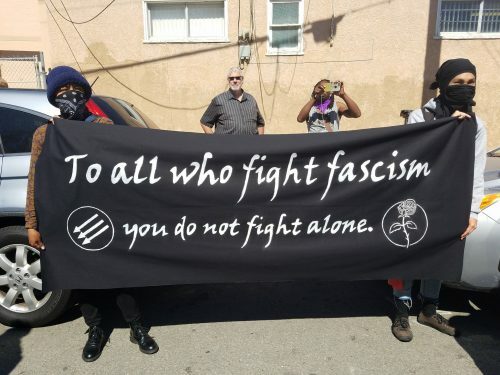 • Finally, anti-fascists in Athens are featured in a report on Al Jazeera (Punching back: Greek gym trains for anti-fascist action, September 19, 2017), while in truthout Sarah Jaffe interviews author Mark Bray about Anti-Fascist Self-Defense: From Mussolini’s Italy to Trump’s America (September 13, 2017). This entry was posted in Anti-fascism and tagged altright, antifa notes, Antipodean Resistance, Blair Cottrell, Charlottesville, Daily Stormer, David Hilton, Hope Not Hate, Jason Kessler, Mark Bray, Moses Apostaticus, Mother Of All Rallies, Neil Erikson, Nick Wakeling, Online Hate Prevention Institute, Patriot Blue, Romper Stomper, The Daily Caller, The Daily Stormer, Tim Wakeling, United Patriots Front. Bookmark the permalink.